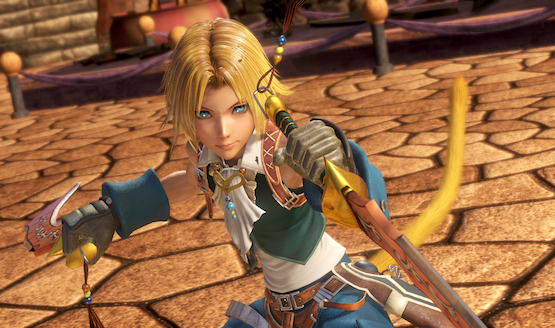 Sparks will fly for free when Square Enix releases a new edition of the fighting game Dissidia: Final Fantasy NT next month. The free edition of Dissidia: Final Fantasy NT will be released on March 12, 2019 for the PS4 and PC. It will come with a weekly rotation of free characters, with the option to buy them separately. (Weapons will also be available to buy). For those who have the full game, the free edition will provide more challengers for them to battle against, as they will be on the same servers. FFXIII‘s Snow was the final character added in the Season Pass. Vayne, Locke, Kam’lanut, and Yuna were also recently added to the roster. No word has been given about a second season pass, but if this free edition is successful, perhaps this will be the case. In fact, Zack, Tifa, and Vivi were found in the game files by dedicated data miners. This Dissidia installment is a 3v3 fighting game set within key locations of the Final Fantasy franchise, such as Final Fantasy X‘s Besaid Island and FFXV‘s Insomnia. You have to work as a team with your fellow players to succeed in battle. There is a story, but it is unlocked through an unorthodox way of playing online and offline games and has no narrative context. The developers of the game, Team Ninja and Koei Tecmo Games, also released a free-to-play version of Dead or Alive 5, which had purchasable characters and costumes. The game ended up getting over 10 million downloads. Dead or Alive 6 will be a full price game when it debuts on March 1st, 2019. The Final Fantasy series so far has sold over 144 million copies worldwide, with 15 installments and many spin-offs, including Crystal Chronicles, Tactics, and World of Final Fantasy.